"So that's the beauty of this strategy, you are, curiously, looking to win by placing a back bet on a likely loser. But even your loser wins; there is still a good chance of a profit." To back a loser that could be a winner, we are going to use a special part of Bet Angel's dutching tool, called 'margin maker'. To understand what we are trying to do it's important to understand what happens during the in-play period of a horse race. It's obvious to state that in any one race, excluding dead heats, only one horse can win. When that horse is about to cross the line it will be trading at or near [1.01] in decimal odds; near certainty that it will win the race. For all the other horses in the market, they must trade at [1000.0] because it's certain at that point that they will lose. So in a ten runner race, for example, you will have definitely see at least one horse get matched at odds [1.01], the minimum odds available, but at least nine at [1000.0], the maximum odds available. Something priced at [6.0] means it has roughly a 17% chance of winning. More importantly, in the context of what we are trying to do, it has an 83% chance of losing. If it loses the price must drift to the maximum of [1000.0]. 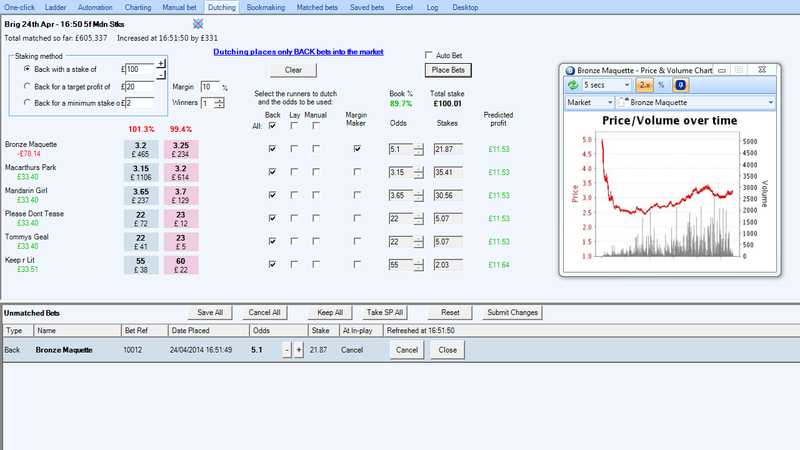 So in essence laying something at an SP of [6.00] and trading out will guarantee you a profit at least 83% of the time. If you trade out before the end of the race at odds lower than [1000.0] then that 83% win rate will rise to a much higher number. The question of course, is how do you exploit this characteristic? 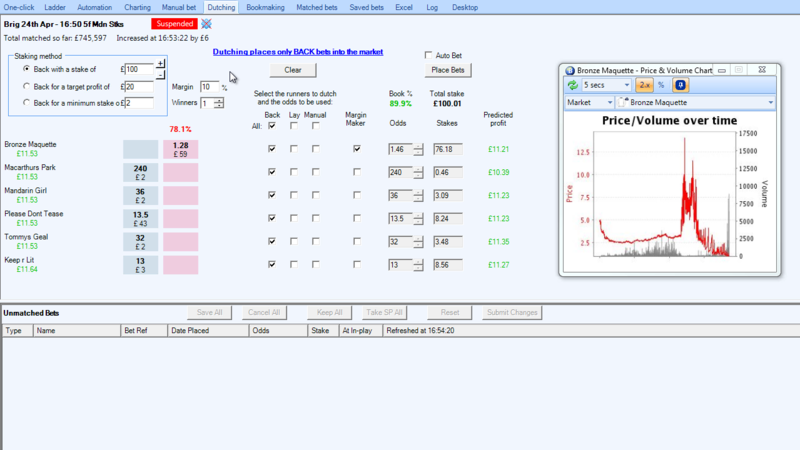 On Bet Angel when using the margin maker you nominate a selection and 'margin' you wish to use and Bet Angel recalculates your bet so that you bet into the market 'under-round'. By this, we mean we place a number of back bets across the market so that we back a 100% chance of winning for less than 100% netting a profit on the difference. In the example we have used here we have marked Bronze Maquette as the margin maker. We have asked for 10% so the bet is currently unmatched at odds of [5.10] and we will turn this into a keep so that it can get match in-play. It will only reach these odds if the horse loses, or more importantly, is out of contention at some point. This race is being run over 5f, the minimum race distance, so the winning distance between the horses will be slight and the market is telling us it will be a close race anyhow, because the front three are roughly equal favourites. In this particular race Bronze Maquette did actually win, but we also profited despite asking for a price that was much higher than the starting price. We made our profit by betting the odds on the favourite would be much higher at some point during the race. Not only did this happen, it actually won! On this occasion Bronze Maquette got off to a slow start, so only a short time after the race started we got matched and made £11.53 regardless of who went on to win the race. So that's the beauty of this strategy, you are, curiously, looking to win by placing a back bet on a likely loser. But even your loser wins; there is still a good chance of a profit. Download a free trial of Bet Angel today!